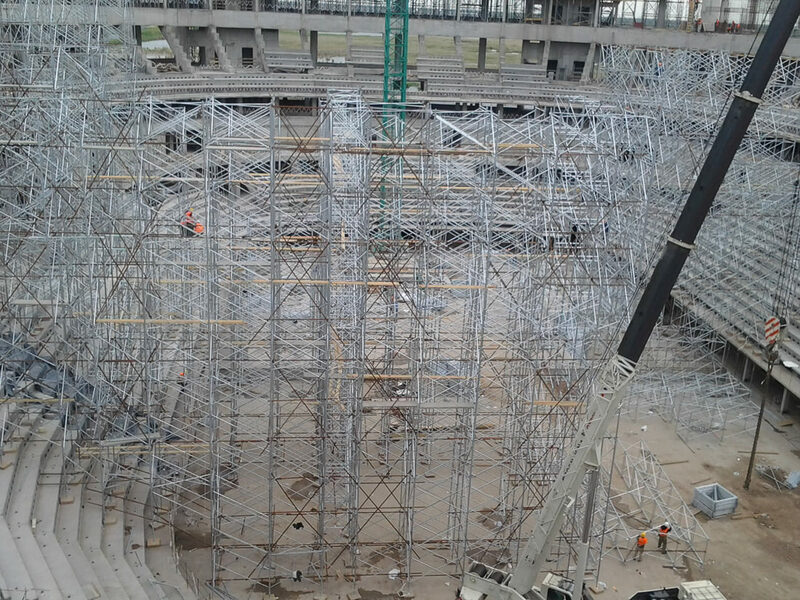 The new Hockey Arena “Ice Palace” in Astana is a circular building with a diameter of 140 meters and 45 meters height, realized with a reinforced concrete load bearing structure. The structure of the roof is composed by main and reticular beams realized with circular hollow sections members. 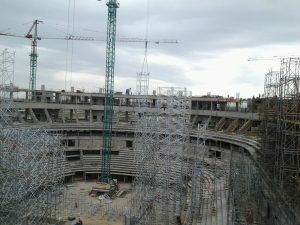 Pilosio designed and supplied a structure for the support of a working platform at 32m height that was employed for the assembly of the steel beams that compose the skeleton of the roof of the new Hockey Arena. The structure had to bear the load of 13 main reticular beams (maximum length 130m, maximum height at the centre line 13.5m), estimated in 70 ton. 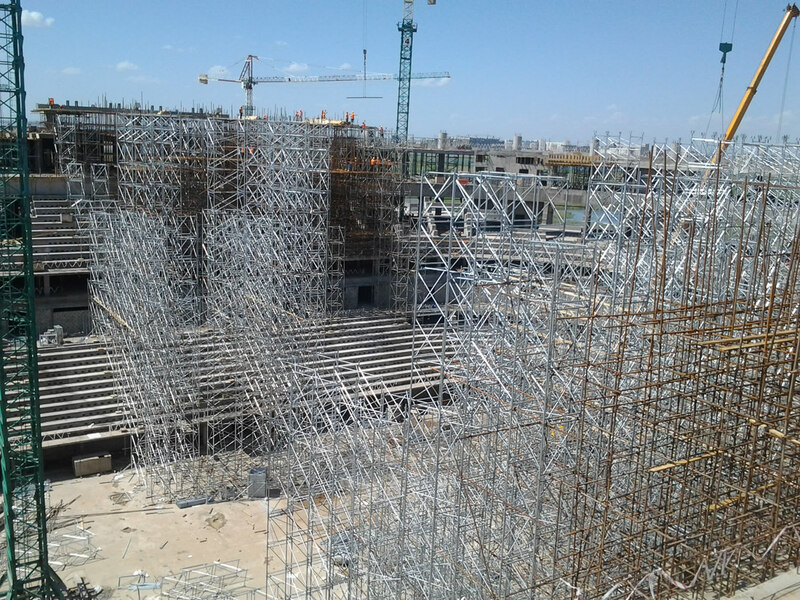 each plus the load of the secondary steel beams and of the staff required for the beams assembly. 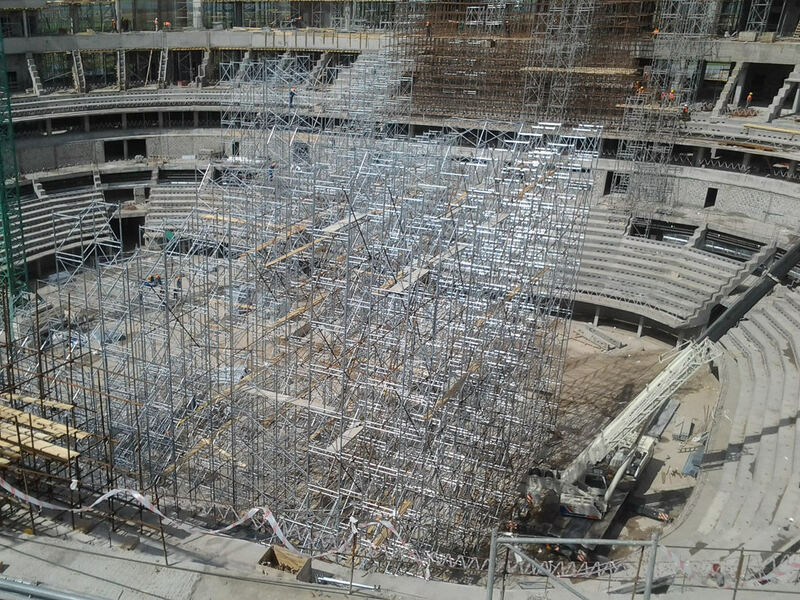 The shoring structure, realized with SIMPLEX galvanized frames, was designed to guarantee a capacity of more 50kN for each leg and is composed of 11 towers (77m long, 4m wide and 32m tall). The towers, placed at a distance of 6m one from the other, were interconnected with secondary structures 4m long and 1.5m wide. 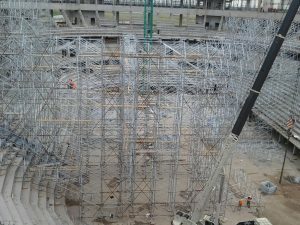 For this construction, Pilosio supplied almost 21,000m³ of SIMPLEX shoring structures equivalent to 10,500 galvanized frames and accessories such as base plates, fork heads, horizontal and vertical braces. Pilosio also supplied a set of 4,000m² of safety net (EN 1263-1 certified) realized with high tenacity PP. The nets were installed on top of the support structures to guarantee safety work of the staff employed for the roof assembly.